A disturbing image of young Israelis sitting by the Gaza border, cheering and watching as bombs fall on Palestinians just a few miles away has evoked widespread condemnation as it circulated on social media. 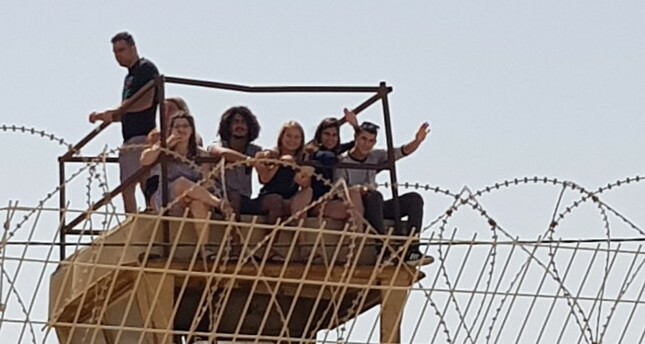 In the photo, shared by Nir Dvori a reporter at Israeli Channel 2 television news on Friday, seven young Israeli adults are seen smiling and waving at the cameras as they sit on an observation tower in Nahal Oz, outside the fenced-off Gaza strip. Many likened the scene to an “outdoor cinema,” calling it disgusting and barbaric to watch as the Israeli military uses live fire and excessive force against Palestinian protesters. The scene is unfortunately not unfamiliar. Back in 2014, some Israelis in the border town of Sderot were spotted drinking, cheering and posing for selfies or recording videos with their smartphones while black plumes of smoke rose from behind them across the border, with each bomb the Palestinian death toll mounting. Nearly 500 Palestinians were injured, 33 seriously, by live fire and rubber bullets on Friday in the second mass border protest in a week, and many more suffered from tear gas inhalation. Meanwhile, at least nine Palestinians were killed, and 1,070 others were injured during clashes with Israeli forces, including five who are now in serious condition. A well-known Palestinian journalist was among the dead, Gaza officials said. The deaths brought to at least 31 the number of Palestinians killed by Israeli fire since last week. Demonstrators are demanding that Palestinian refugees be granted the “right of return” to their towns and villages in historical Palestine from which they were driven in 1948 to make way for the new state of Israel.